Entirely teak monastery built in 1834 Inwa. This teak monastery on the island of Inwa (Ava) dates to 1834. It continues to serve its purpose today, with the monks operating a small school for local children. Innwa (formerly Ava) is a city in the Mandalay Division of Burma, situated just to the south of Amarapura on the Ayeyarwady River. Its formal title is Ratanapura, which means City of Gems in Pali. The name Innwa means mouth of the lake, which comes from in, meaning lake, and wa, which means mouth. Known as Ava to the British and A-wa (mouth) in Burmese, it evolved to its modern name Innwa. Ava was capital of Burma from 1364-1841 founded by King Thadominbya on an artificial island at the confluence of the Ayeyarwady and the Myitnge created by digging a canal linking the two rivers. Prior to this, Sagaing had been capital, but after Sagaing fell to the Shan, the court moved across the river to Ava. The kings of Ava set about restoring Burmese supremacy, which had disintegrated after the collapse of Pagan to the Empire founded by King Anawrahta in 1057. A Burman Ava Dynasty (1364-1527) was eventually established at the city of Ava by 1364. Pagan culture was revived and a great age of Burmese literature ensued. The kingdom lacked easily defendable borders, however, and was overrun by the Shan in 1527. The Kingdom of Ava was involved in continuous warfare with Tai (Shan) saophas to the north on the frontier with Yunnan. There were repeated Tai raids on the capital of Ava and Ava sent military northwards to attack Tai fiefdoms such as Mong Mao. The Ming dynasty that ruled China from the late fourteenth century often tried unsuccessfully to put an end to this warfare through traditional Chinese diplomacy. Ava occasionally became involved in the warfare between the Ming and Tai in Yunnan such as in the Luchuan-Pingmian Campaigns (1436-1449). Following is the detail account of one of those affairs among Ava, Shans, and China in 15th century, recorded in details by Burmese Historian U Kala in his U Kala Mahayarzawindawgyi. In the Burmese lunar year 774, the Christian year 1411, Shans from Mawtone Mawkel invaded the town of Myedu in upper Burma. King Mingaung of Ava sent an army of eleven corps led by the Crown Price Minyekyawzwa to repel the Shans. The huge army consisted of three hundred war elephants, four thousand strong cavalry, and eighty thousand strong infantry. Once Minyekywzwa reached Myedu he immediately attacked and destroyed the smaller army of Mawtone Mawkel brothers. As the brothers fled on horseback to China, Minyekyawzwa brought their families, elephants, horses, and many prisoners of war back to Ava. A few months after Myedu war Minyekyawzwa marched down into Lower Burma and attacked Pegu. Riding the Pegu King Yarzardayit’s own war elephant called Bagamat, Thameinbayan, a son-in-law of Mon king, came out of Pegu and had a duel with Minyekyawzwa. But he was defeated and taken prisoner together with his elephant Bagamat. Minyekyawzwa then marched farther to Bassein and laid siege to the town. But Bassein was too strong to be taken. So the Burmese army marched to nearby Myaungmya and laid siege to the town. During the long siege, Minyekyawzwa took Thameinbayan and more than twenty high-ranking Mon prisoners of war back to Ava in eight fast boats along the River Irrawaddy. The upstream trip took eleven days. Minyekyawzwa stayed for only seven days in Ava and came back down to Lower Burma. The return trip downstream to the town of Dala across the river from Dagon (Rangoon) took only four nights and five days. His army then laid siege to the towns of Dagon and nearby Syriam. Meanwhile, the fleeing Mawtone Mawkel brothers had reached China, where they begged the Chinese Emperor Uteebwa to help them to rescue their captured families now in Burmese hands. Chinese sent their General Erawaka with an army of two hundred war elephants, two thousand strong cavalry, and forty thousand strong infantry into Burma and reached Ava, then the royal capital of Burma. The Burmese army led by Minyekyawzwa then was waging a protracted war of attrition against Yarzardayit led Mons near Pegu in Lower Burma and couldn’t come back to relieve the capital Ava. The invading Chinese surrounded Ava and sent in an ultimatum demanding that Burmese either release the captured families of Mawtone Mawkel brothers or come out and fight them outside. Burmese had refused and the Chinese laid siege to Ava, and after a month the Chinese army had run out of food and so they sent another ultimatum into the besieged city. This time the Chinese had challenged the Burmese to a duel on horseback and if their man was defeated they would end the siege and withdraw, but if their man won Burmese had to release the families of Mawtone Mawkel brothers. In a court gathering King Mingaung asked for anyone who dared to take the Chinese challenge, but none there dared as all the Burmese warriors and most of the Burmese lords were with Minyekyawzwa in Lower Burma. Then the lord of Paungde told the King about the Mon prisoner Thameinbayan, and advised him to ask Thameinbayan to take the challenge as he was the bravest Mon warrior who even dared to fight Minyekyawzwa in an elephant duel. So King Mingaung ordered and Thameinbayan in leg Irons was brought to him. King Mingaung asked Thameinbayan if he was brave enough and willing to face the Chinese warrior, and the Mon lord Thameinbayan answered that he wasn’t afraid of anyone on this surface of the earth, face to face, sword to sword, shield to shield, either on an elephant, or on a horse. So the Burmese king released him and let the princesses wash his hair and give him a feast good enough for a king. After that King Mingaung promised him a reward better than from his own Mon king if he defeated the Chinese warrior, Garmani. Thameinbayan bowed to the king and guaranteed the favourable outcome for the Burmese, his captors. King Mingaung then showed Thameinbayan every single horse in Ava to choose, but he didn’t find the horse of his liking. Only later Thameinbayan saw and liked a mare in the colour of tamarind seed grazing by the moat and took it as his horse. He then told Burmese he needed seven days to know the horse well, and he would then face the China’s Garmani on the seventh day from then. Once Burmese told the Chinese the date for the duel their hero Garmani spent that seven days drinking and eating and boasting to kill Thameinbayan horribly on the day they meet. So King Mingaung gave him a goading hook used in plodding an elephant behind its ear, but many Burmese lords laughed at Thameinbayan and said that our Mon hero was already looking for a lemon to cook the rabbit even before he had a rabbit in hand. Thameinbayan just bowed to the King and rode out of the besieged city towards the Chinese army. He was followed by a few people who could speak Chinese. All the people of Ava including the Buddhist monks climbed up the city wall to watch the duel ground from above as Garmani also rode out from Chinese army’s camp to meet Thameinbayan once he saw him coming out. In a full body armour with a ruby crusted enormous sword in his huge right hand, seven foot tall Garmani rode a giant red horse with a gold saddle. His face was painted black and he also carried a gold-plated long spear. Under a helmet of seven steps, he looked like a Chinese demon straight out of their folklore. He met Thameinbayan near the water-filled moat. Through the interpreters Thameinbayan said to him that they both were the lords and warriors, and so they should show the people watching from both sides what they were capable of on the horseback. Garmani agreed. Thameinbayan leaned forward and made himself as small as possible on the horse and then rode real fast. Garmani copied him masterly and rode even faster. Thameinbayan then stood up on the saddle and rode away from him. Garmani copied him again and rode faster again. Then Thamenibayan stretched both hands and rode again while still standing on the horseback. Garmani copied him again and rode faster again. While he rode past him on his left Thameinbayan saw the thread tying the two armour plates covering his right underarm was cut and loose. Immediately Thameinbayan yelled out to Garmani that they had ridden three times and now was the time to fight. Holding the short spear in right hand behind his back and stretching the left hand by his side, he rode away from Garmani. Garmani chased him immediately. As Garmani reached near him, Thameinbayan wheeled his horse around to the right and faced him. After stopping in his track Garmani immediately raised his enormous sword and tried to strike down Thameinbayan with a mighty stroke. In the process the thread holding his underarm plates broke exposing his flesh through a gap of at least four fingers width, and Thameinbayan, expecting that perfect opportunity, swiftly sent his spear thrust through the gap. The spear went in at Garmani’s right underarm, through the body, and came out at left underarm, killing Garmani on the spot. He then cut his head with a single stroke of his sword and picked the still rolling head up from the ground with the goading hook and placed it in the basket tied to his saddle. He then rode back and entered Ava while the mass of people on the wall cheered. Even the Chinese were amazed by the short and decisive fight and they said that Thameinbayan was not a man but a demon from hell. Hugely satisfied King Mingaung gave him rewards and married him to his youngest daughter Talokeyarzathu. The Burmese king also gave Thameinbayan the town of Legai. The people of Ava also gave him many rewards. As promised the Chinese army folded their camp and withdrew back to China. In 1555, Ava fell to the southern Burmese Kingdom of Taungoo which led to the founding of the Second Burmese Empire by King Tabinshwehti, but in 1636, the king of Taungoo relocated his own capital to Ava. In 1752, the Mon revolted against Burmese rule and sacked Ava. A couple of years later, the founder of the new Konbaung Dynasty and the Third Burmese Empire, Alaungpaya, crushed the Mon revolt, and after a period with Shwebo as his capital, re-established the court in Ava. 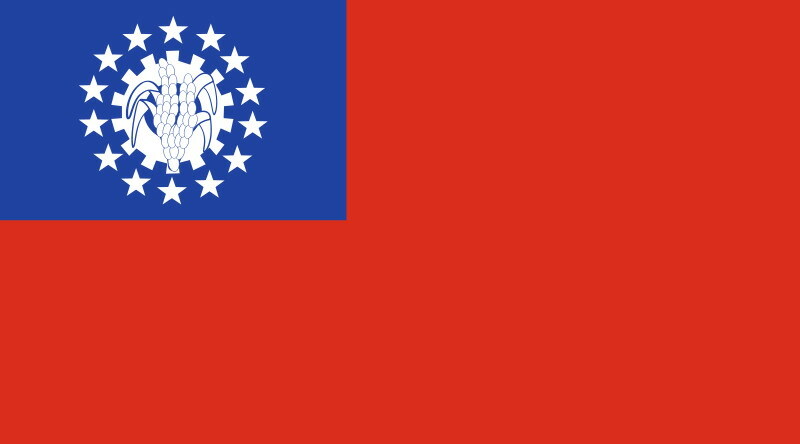 Following the British conquest of Lower Burma after the Second Anglo-Burmese War (1852-53), Upper Burma was commonly called the Kingdom of Ava or the Court of Ava. During the reign of King Bodawpaya (lit. Lord Royal Grandfather,1781-1819), the capital was moved to nearby Amarapura. However, his successor, King Bagyidaw (lit. Royal Elder Uncle, 1819-1837), moved the Court back to Ava in 1823. When a tremendous earthquake caused extensive damage in 1841, Ava was finally abandoned for Amarapura. Little remains of the ancient capital today. Because of the earthquake that happened in 1939, most of the palaces in Ava were destroyed. Inwa was formerly known as Ava and it is located 21km from Mandalay. Inwa was also known as Yadana Pura. It was first founded as a capital by King Thado Minbya in 1364 A.D. It is the confluence of the Ayeyarwaddy & Myint Nge rivers. But the king had a canal dug to join the Myint Nge and Myint Tha rivers thus cutting off the capital as an island, safe from enemy attacks. As successive kings ruled the war with King Raza Darit of Bago for many years, the Shan chief Thohan Bwa took the advantage and overran the capital. Gradually the kingdom grew weaker and finally it became a vassal to the Taungoo Empire. Later kings shifted the capital from Inwa back and forth many times until King Bayint Naung's son King Nyaung Yan re-established his capital at Inwa in 1596 A.D. It continued to be capital till 1782 when Bodawpaya moved the capital to Amarapura. But his son King Bagyidaw moved his capital back to Inwa. It was destroyed by the earthquake of 1838. The ruins of the palace, the massive fort walls and moat can still be seen of the splendour of the past when it had been the capital for more than four and half centuries. Inwa lies south of Mandalay and can from there in only 30 minutes of drive be attained. This old king city was long time capital of Oberburma. The foreign country was at present well-known Myanmar as the Kingdom of Ava.The king palace at that time does not exist any longer, however still the Nanmyint awake tower. From 27 meters height of bird perspective one can examine the range of the historical place. Numerous pagodas, temple and monasteries outlasted however Inwas' eventful past. The monastery Maha Aung Myay Bon Zan built with brick and stucco is particularly interesting. It was established to 1818 by the queen Me Nu for the royal abbot at that time U Po. On the road to Sagaing, just before you reach the Inwa bridge, there is a road branching east ward. The Inwa bridge crosses the Ayeyarwaddy River. This road leads to a ferry station where you can cross the Myittha river to reach Inwa.